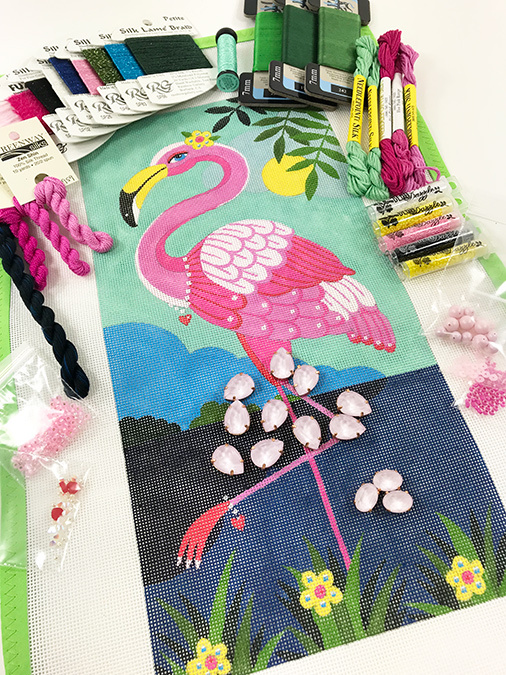 How many pink threads, beads and crystals does it take to stitch a flamingo? Not as many as you might think. This is a lulu mypinkturtle canvas that I am teaching this weekend at the beehive. Aren’t the threads yummy in all their glorious pinkness? Wait until you see what we do with those big fancy crystals? I couldn’t wait to show off the threads in the kit. Consider this a sneak preview until I post again with pictures of how we are stitching her. We have available kits so if you want one, let us know. Here’s the link. hmm…. maybe not as many threads….. but I bet those threads will dance!! She’s going to be fabulous!!!! !